Some of you will recall that upon publishing The Return of Black Star, a novel cobbled together from early yarns written by Zorro creator Johnston McCulley for Street & Smith’s Detective Story Magazine, we announced it would be followed by two similar collections by that author. Titled The Thunderbolt Strikes and The Spider Spins His Web, these book-length compilations gathered together the first three novelettes in each of those McCulley series, also published sequentially in Detective Story. Priced at $19.95, like the other pulp reprints in our line, Return of Black Star didn’t exactly catch fire, sales-wise, and we indefinitely postponed the releases of Spider and Thunderbolt. Having done the time-consuming work of scanning and editing these stories, we’ve decided to publish the material in a different format that originally envisioned, rather than see them languish on the shelf, so to speak. Therefore, rather than make the trilogy available as three twenty-dollar books, we’re bundling them together between two covers and pricing the jumbo-sized volume at $35—which works out to less than $12 per novel. We realize this will inconvenience those of you who did pay $19.95 for Black Star, but look at it this way: Buying the Omnibus for $35 will still be cheaper then buying Spider and Thunderbolt separately at $19.95 each. 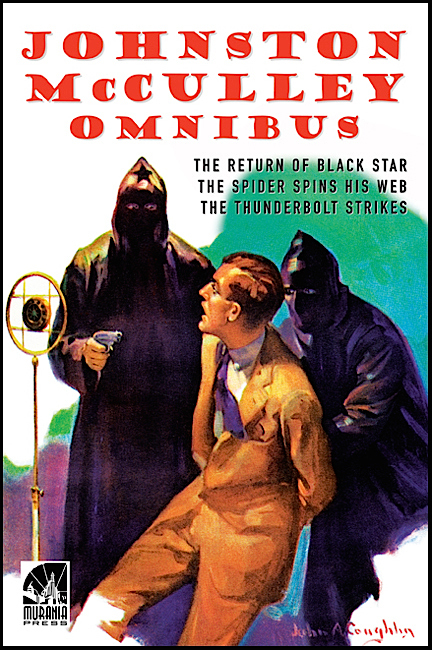 You’ll notice the Omnibus uses the same John A. Coughlin Detective Story painting we put on Black Star‘s cover. Candidly, we feel this piece of artwork is more attractive than those DSM covers heralding publication of the initial Spider and Thunderbolt stories; hence, we’re giving it a second revival. Additionally, the Omnibus will feature an expanded version of the introductory essay we wrote for Return of Black Star. We’ve completed layout and will be doing a few last-minute tweaks this weekend before registering the title and submitting the corrected digital files to our printer. We expect to get approval and begin soliciting orders by next Friday. I already had the original Return of Black Star, so hadn’t ordered that, but I will be ordering this collection to get the others. Does the poor sales of the first book mean this collection is all you will be doing on that planned Johnston McCulley line? I was hoping for complete Black Star and Crimson Clown collections. Well, hope springs eternal, but unless the OMNIBUS sells better than RETURN OF BLACK STAR, I doubt there will be further McCulley collections. As mentioned in this post, I’m really just publishing the omnibus so that the time I’ve already invested in the Spider and Thunderbolt books doesn’t go to waste.